Tekashi 6ix9ine is unabashedly living his best life. Of course, there are some downs along the way, but the young rapper is mostly riding a high. His latest celebration comes in the form of hanging out with a rap icon. Tekashi and 50 Cent linked up to party and the rising star was stoked to share the moment on his socials. His caption is simply endearing: "I'm a happy kid now :)." The video post included snippets of both rappers getting lit in a club. 50 Cent pops a bottle of champagne which he passes on to the youngster. Tekashi receives the honour of spraying the crowd with the bubbly while bopping to the beat of his track. 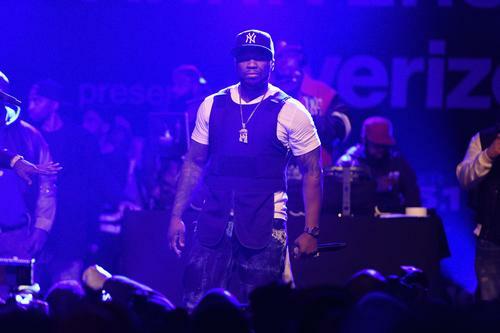 The other snippets include 50 Cent vibing to 69's music as he raps along to his songs. Seems like 50 is co-signing the young talent officially with this appearance. Then again, he might also be touring his brand of champagne, Le Chemin Du Roi. The entrepreneur was recently seen with Russ with his bubbly in hand. The business can definitely benefit from a younger crowd of patrons. Either way, the joint appearance still adds to Tekashi's clout. This comes after the announcement of his joining Nicki Minaj and Future on their NICKIHNDRXX Tour. The Brooklyn native got big things poppin' for real.